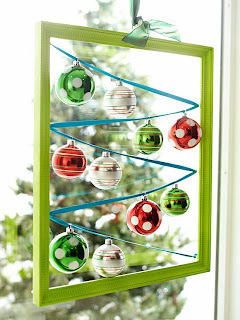 Look out on something pretty ~ a basic painted frame strung with ribbon and hung with ornaments jazzes up a window and requires zero rearranging. 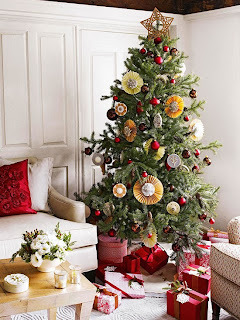 Save space by swapping out year-round photos, figurines, and knickknacks for your favorite holiday decorations. This bookshelf got a merry makeover from jolly snowmen, wrapped boxes, and a natural garland. Let side tables do their part by topping them with a forest of merry paper trees. Each one features colorful patterned paper and a festive star on top. Best of all, they hide small bags of candy for your holiday guests. 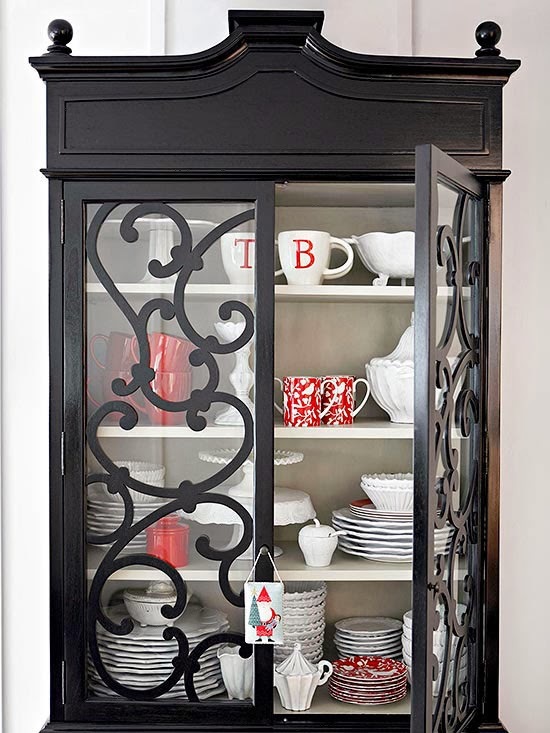 Let your favorite holiday dishes do the decorating for you: Display them in a glass cabinet for a merry and oh-so-easy accent. If you don't have holiday dishes, try pairing plain white china with red mugs or dessert plates. 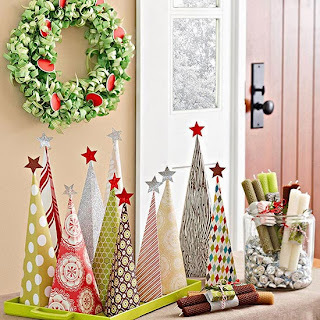 Turn a holiday chore into a festive decoration by displaying your Christmas gifts early OR wrap faux gifts ;). Wrapped gifts make a big impact in little space ~ try adding decorative bows and using different wrapping papers to create variety. No wall space for a wreath? No problem. 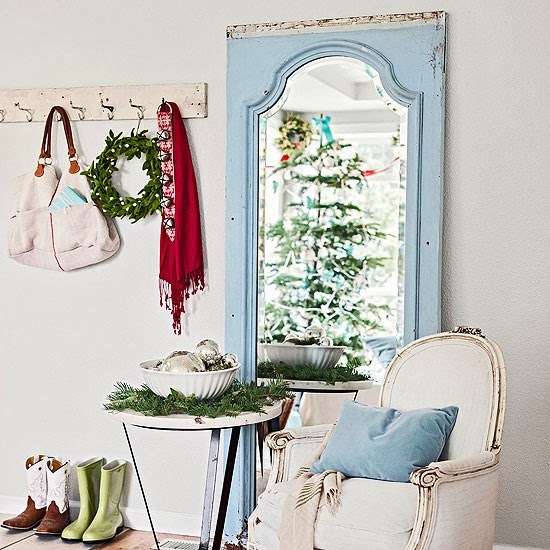 Hang an ornament-filled beauty from a display case, a side table, your mantel, or even interior windows for a quick pop of Christmas. Old photos are great conversation starters, particularly during the holidays, and this display takes up minimal wall space. Start with baby photographs, then cut them in a circle, mount on foam core, and arrange in a tree shape. Little space, big impact. 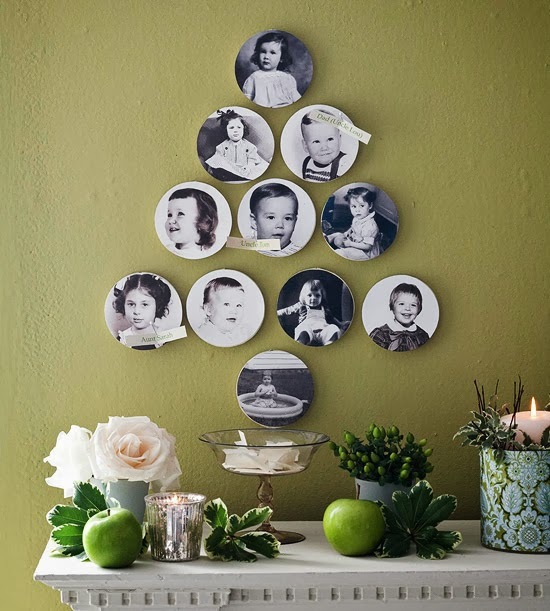 Editor's Tip: For a great together-time activity, have family members guess who is who in each photo AND use Command hooks so they can be taken down without leaving a hole. 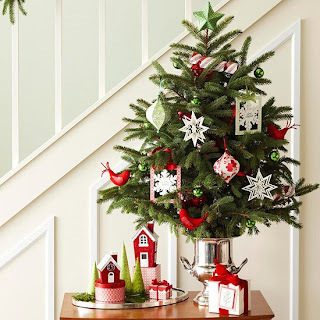 A small table by the stairs is a prominent small-space spot to start your Christmas merriment. Add a little, lightly decorated tree and a modest display to the tabletop. To give the evergreen a bit of height, place in a tall silver vase. 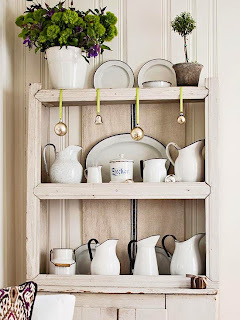 You already have coat hooks, so why not dress them up? Hanging winter-theme items, like a warm wool scarf, sleigh bells, and a greenery wreath, from each hook takes them from functional to festive. 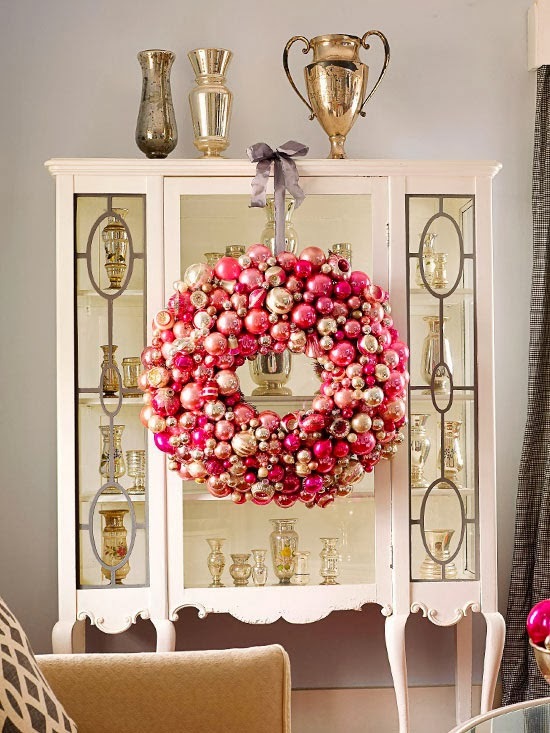 Dress your furniture for the holidays with glittering glass balls. Choose ribbon that matches the room's color scheme (we chose light green), then use removable adhesive hooks to hang the ornaments from your bookshelf, cupboard, or mantel. 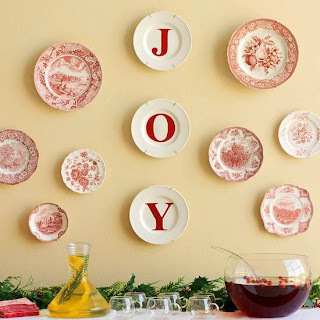 Dish up cheer with this simple holiday plate display. 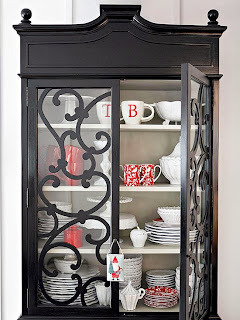 Cut letters from red paper or purchase stick-on vinyl letters to adhere to white plates. 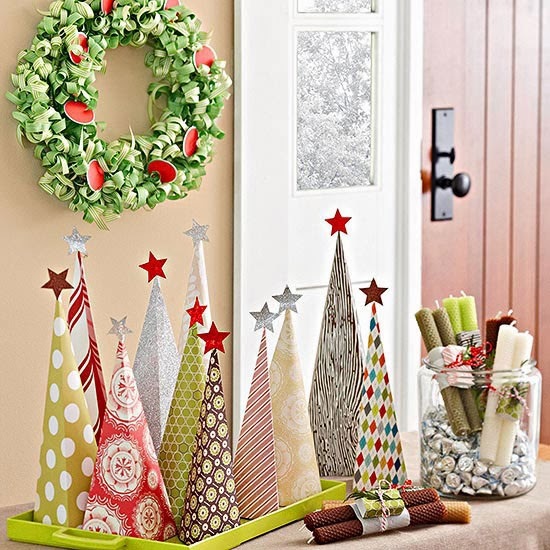 Removable mounting strips or plate hangers make this stunning seasonal sentiment easy to dismantle.